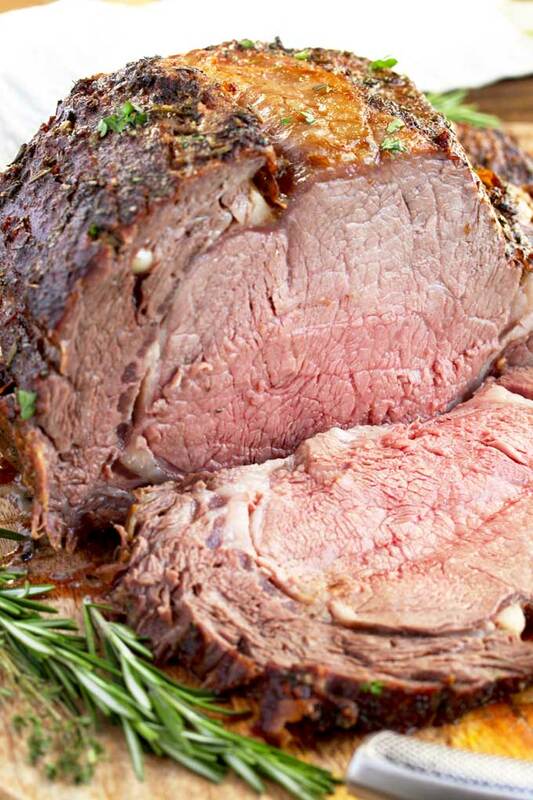 This Prime Rib Roast Recipe is elegant, succulent, easy to make and perfect for the holidays! 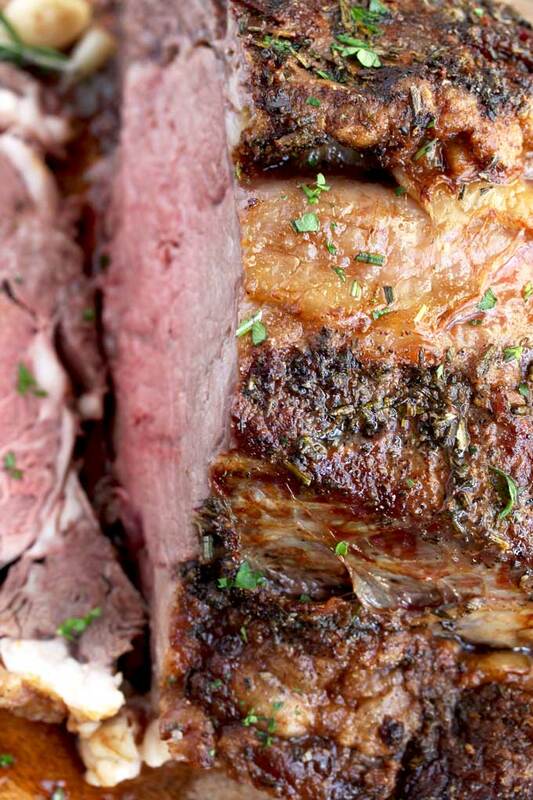 This Herb Crusted Prime Rib Roast is tender, juicy and cooked to perfection! Plus everything you need to know about buying and cooking Prime Rib! This amazingly tender and melt in your mouth Prime Rib Roast is definitely a show stopper! Rosy pink in the center (unless you want to cook it longer) with a savory deep golden herb crust full of flavor. This Prime Rib Roast recipe is my go-to recipe when I want to impress my guests on special occasions or during the holidays. Is Prime Rib a “Prime Grade” Cut of Beef? How To Shop for the Perfect Prime Rib? Should I buy a Bone-In Prime Rib or a Boneless Rib Roast? How Much Prime Rib Do I Need Per Person? How Long To Cook a Prime Rib Roast Per Pound? How To Know When the Prime Rib is Done? How To Carve your Bone-In Prime Rib Roast? 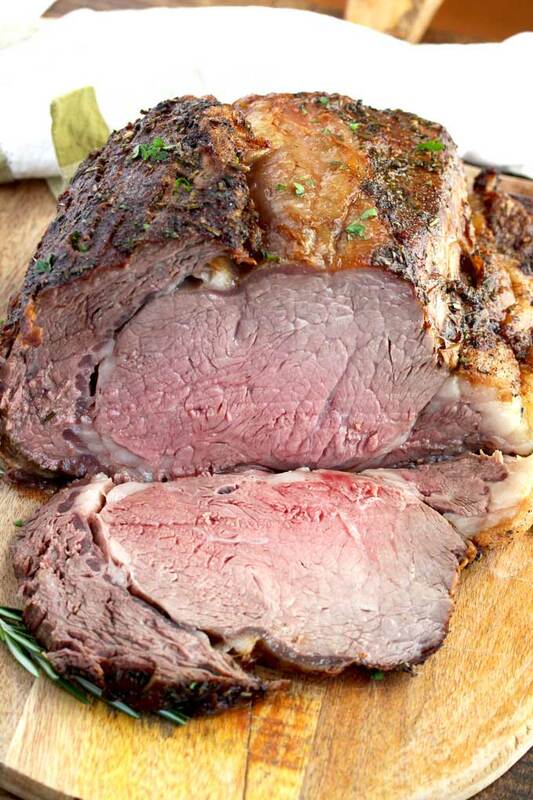 How To Make This Prime Rib Roast Recipe? 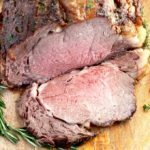 What To Serve with Standing Rib Roast? JUST TAKE ME TO THE PRIME RIB ROAST RECIPE ALREADY! 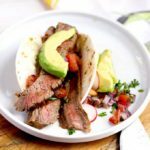 If you would rather skip my tips, tricks, essential cooking information and similar recipe ideas and get straight to this delicious recipe – simply scroll to the bottom of the page where you can find the printable recipe card. But, you may be missing out on some good stuff! Prime Rib also known as “Standing Rib Roast” or Beef Rib Roast is a tender and flavorful cut of beef coming from the rib area of the steer. Specifically ribs 6 through 12 (Ribs 1 to 5 are in the chuck area). This area comes from the loin muscle which is not heavily used by the animal – this is the reason why it is incredibly tender. This is the same muscle from which Rib Eye steaks and New York steaks are cut from. Prime Rib Roast has a large eye of meat in the center and is perfectly marbled with fat, which makes for a very juicy and tasty cut of meat. No. The USDA has a grading system that has nothing to do with the name given to one of the best cuts of beef. As a matter of fact, most Prime Rib Roasts sold at supermarkets are graded “choice” by the USDA. You can purchase Prime Ribs graded both “Prime” or “Choice”. A whole 7-rib Prime Rib Roast is a very large piece of meat and it can weigh more than 25 pounds. Butchers usually cut the Prime Rib Roast into 2 smaller roasts that are more manageable and will fit into anyone’s oven. First Cut, also known as small end or loin end consists of ribs 10 through 12. This is the area closer to the loin. 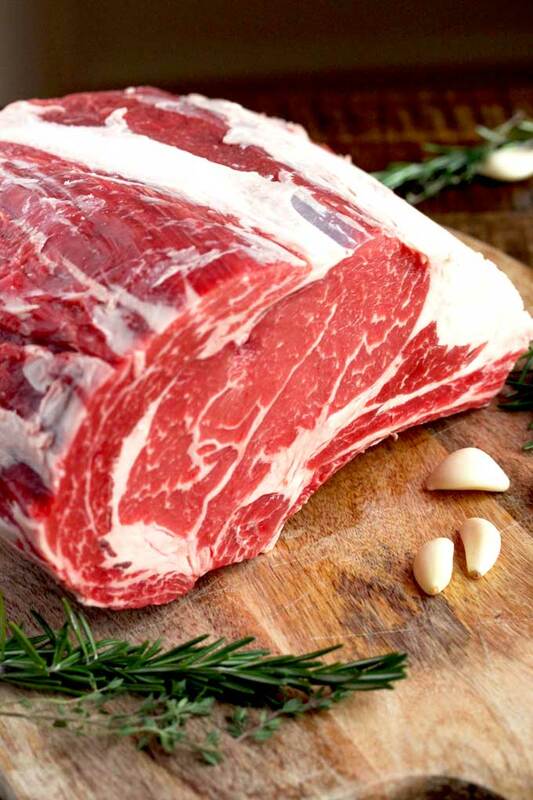 It is usually the “preferred” cut as it is meatier and has less fat although still well marbled. Second Cut, also known as the large end or chuck end consists of ribs 6 through 9. This cut contains more fat. Think of fat as “more flavor”. I prefer Bone-In Prime Rib Roasts. Roasting meat on the bone produces a tastier dish in my opinion. I also think that cutting off the bone before slicing the roast is quite an easy task. If you are not sure, you can always ask your butcher to cut the meat off the bone and tie the bone back with kitchen twine or simply get a boneless rib roast. You need about 1 pound of raw bone-in prime rib per person. This translate into about 8 ounces of cooked prime rib per guest. Cooking a Standing Rib Roast is not difficult at all. However, to make the best prime rib recipe, I watch the cooking process carefully. This doesn’t mean I stress over it, but it means I use an instant read thermometer and check a few times to make sure the temperature is where I need it to be. I always start cooking this Prime Rib Roast recipe at a higher temperature – 450 degrees Fahrenheit, for 30 minutes. Then I lower the oven temperature to 325 degrees Fahrenheit and cook until the instant read thermometer reaches 110 degrees for rare temperature (read more about temperatures below). Estimate about 15 minutes of cooking time per pound of prime rib. This is all about your desired temperature. How do you like your beef cooked? Rare? Medium-rare? After removing the rib roast from the oven, you will let it rest for about 15 to 20 minutes before carving it. During this time, the meat temperature redistributes and goes about 5 to 10 degrees higher. Remember, you can always cook a rib roast longer, if need be. However, if you cook it too long, there’s no going back. 120°F : RARE, The meat will look bright red and soft to the touch. 130°F : MEDIUM-RARE, the meat is turning a pinkish color and slightly firm to the touch. 140°F: MEDIUM, Rosy pink and quite firm to the touch. 150°F: MEDIUM-WELL, has a pink hue but it’s turning grayish in color and is very firm to the touch. Almost looking a bit dry. 160°F: WELL-DONE, there’s nothing pink about it! Your meat will be on the dry side and extra firm. After resting the Standing Rib Roast, remove the bones with a sharp knife. Just cut around the contour of the bones getting between the bones and the meat. This way you will remove them all in one piece. Now your roast is ready to be sliced. Although some restaurants serve thick 1-inch slices of Prime Rib per person, I like to slice my roast in about 1/2-inch thick slices. If possible, season your standing rib roast the night before you will be cooking it. This is not required, but it helps developing some extra flavor. With a sharp utility knife, cut 6 small slits all over the prime rib. Insert the garlic cloves into the slits. In a small bowl mix the olive oil, chopped rosemary, chopped thyme, garlic powder, salt and pepper. Although the herb/oil rub contains salt and pepper, I like to sprinkle a little extra salt and pepper right on the meat. We are cooking a very large piece of meat so I think a little extra seasoning is always a must. If you are sensitive to salt, you can skip this step. Rub the herb/oil mixture all over the roast. If seasoning ahead, refrigerate the roast uncovered until ready to bake. Take the rib roast from the refrigerator at least 30 minutes before cooking. This will bring the meat to room temperature so it cooks more evenly. Place the rib roast bone-side down in a roasting pan. Place in the 450 degrees oven and cook for 30 minutes. Lower the oven temperature to 325 and cook until the internal temperature of the meat is 120 degrees Fahrenheit. Make sure the thermometer is exactly in the center of the roast. 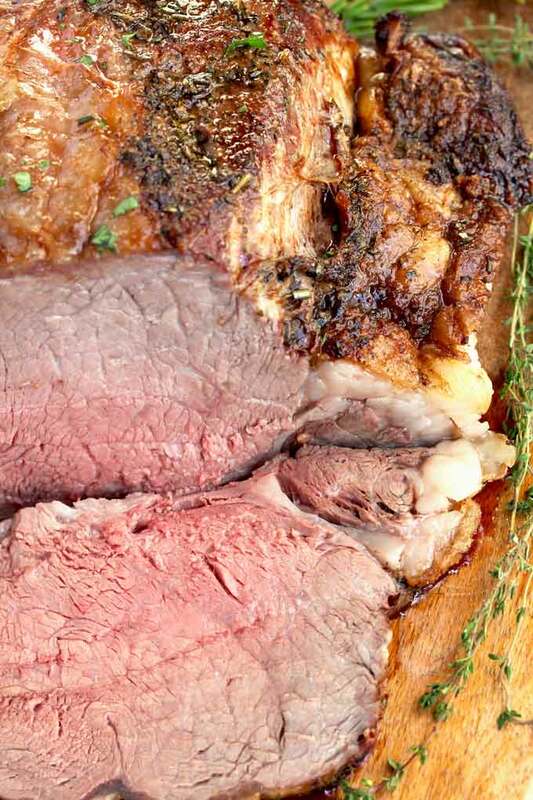 What To Serve with this Prime Rib Roast Recipe? 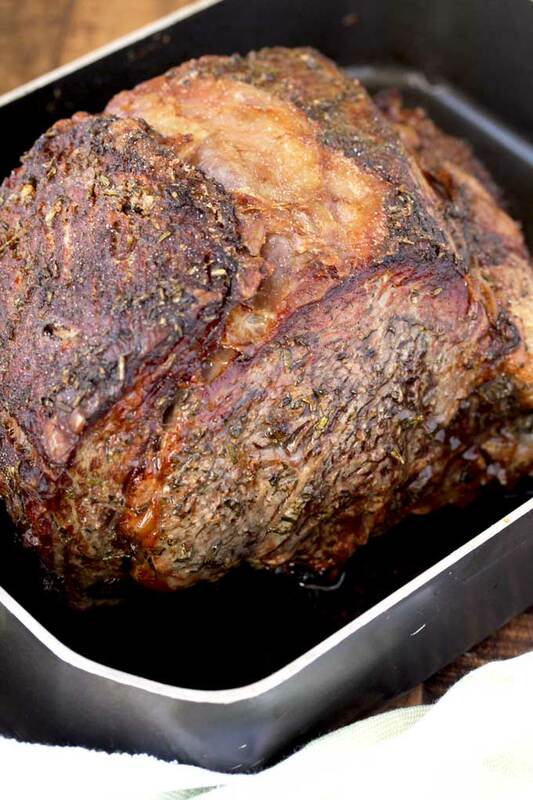 WANT TO TRY THIS PRIME RIB ROAST RECIPE? PIN IT TO YOUR MAIN DISH OR HOLIDAY BOARD TO MAKE IT LATER!! This Prime Rib Roast Recipe is elegant, succulent, easy to make and perfect for the holidays! 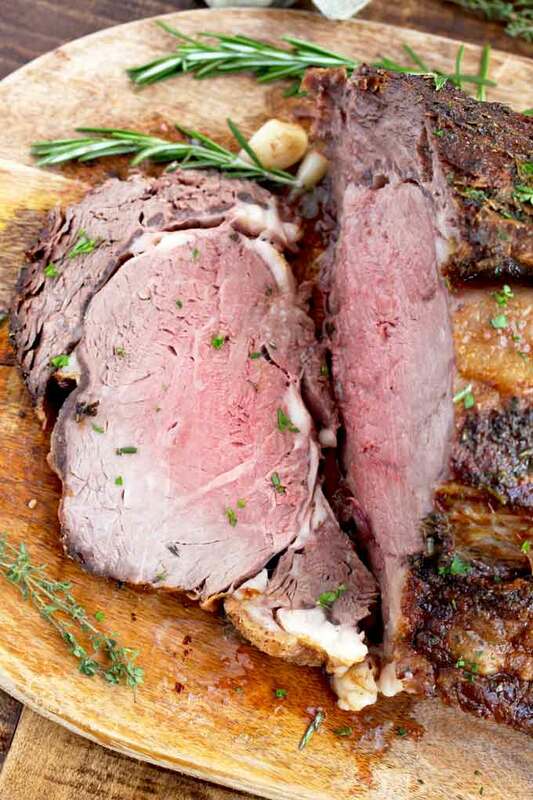 This Herb Crusted Prime Rib Roast is tender, juicy and cooked to perfection! I like to sprinkle the roast lightly with salt and ground black pepper before rubbing the herb/oil mixture. This is optional, however since we are cooking a large piece of meat I think a little extra seasoning is always a must. If you are sensitive to salt, you can skip this step. Cooking time is approximately and based on a 6 pound roast. Exact time will vary depending on the weight of your roast. Time does not include any marinating/resting time in the refrigerator as this is optional but highly recommended. Thank you for all the tips and information about buying and making prime rib. It looks delicious and perfectly cooked. I’ve been a bit intimidated by the thought of making such a fancy meal but all my fears are now put to rest thanks to your detailed article. I’m going to surprise my family by making this recipe for Christmas. Looks amazing and delicious. I really appreciate all the tips and detailed information. 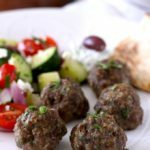 I had the honor to try this recipe at a friend’s house and God ohh God! It was delicious! I personally like my temperature “well-done”, yes, I’m crazy, I know, but STILL this was tender and delicious! Lots of flavor on every bite! My friend recommended this blog and after looking at the detailed explanation, I might cooked this one myself! I made this for my husband’s birthday over the weekend. It was phenomenal! So much flavor, I seasoned the meat with the herbs and garlic and put it in the refrigerator for about 4 hours. It turned out perfect. Thank you. Thank you! Say happy birthday to you husband! I cooked myself this recepie because I want to try something different for Christmas this year. Oh gosh!!! can’t wait to serve this to my huge family, I know they’re going to go nuts, it is so delicious and Kathy is so detailed on every single step. Even if you didn’t ever cook, you’ll be succesful. I really need your advice Kathy, how many pounds of prime rib should I buy for 25 people, do you think if I double this receipe would be enough? Thank you in advance, you made my Christmas a great one!!! Hi Angelina, thank you so much for your kind comment. I really appreciate it. As noted in the post, you need about 1 pound of bone-in prime rib roast per guest. Although you need a 25-pound prime rib roast to feed 25 people, you may be able to get away with a 23-24 pound roast if you are counting children as part of your guests (or people that don’t eat quite as much). You can definitely double the rest of the ingredients – BUT go a little lighter on the salt.